Newcomer Family Obituaries - Kevin F. Dunnigan 1954 - 2018 - Newcomer Cremations, Funerals & Receptions. Kevin F. Dunnigan, was born on February 9, 1954 in Baltimore, Maryland. He entered Heaven’s gate on July 29, 2018, at the age of 64. 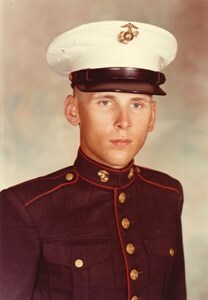 A dedicated United States Marine, Gunnery Sergeant (ret.) Dunnigan unselfishly served over 20 years, spanning from the Vietnam War to the Gulf War as Meteorological Oceanographic Analyst and Forecaster, earning awards and commendations for his dedication and service. His love for the military traditions and people did not stop with his retirement from military service, as he continued to support the United States military as a contractor at Buckley Air Force Base, Colorado. Besides his love for his wife, Patricia, he loved watching old war movies and reading war history books. But beneath his rugged charisma and sense of humor, there was a man who also loved, wood working and ceramics, as well as a passion for model trains. His time was spent giving to his three children: Constance Szeszko, Kristina Dunnigan, Angela Kligora, and his six grandchildren. You could often find him joking, storytelling, supporting their achievements and being the best Father and Pop-pop he could be. His spirit stretched from coast to coast and around the world, as the people he met will never forget the interaction no matter how quick or long. "I could not stay another day, to love, to laugh, to work or play; Tasks left undone must stay that way. And if my parting has left a void, then fill it with remembered joy." A celebration of his life and final military honors will be held on Aug 8, 2018 at the Fort Logan National Cemetery in Denver, Colorado. Add your memories to the guest book of Kevin Dunnigan. You left us way to soon. You will be missed. A thousand memories of you growing up, having a military career and raising a beautiful family have been in my memory the last few days. Rest in peace, dear nephew. Semper Fi.